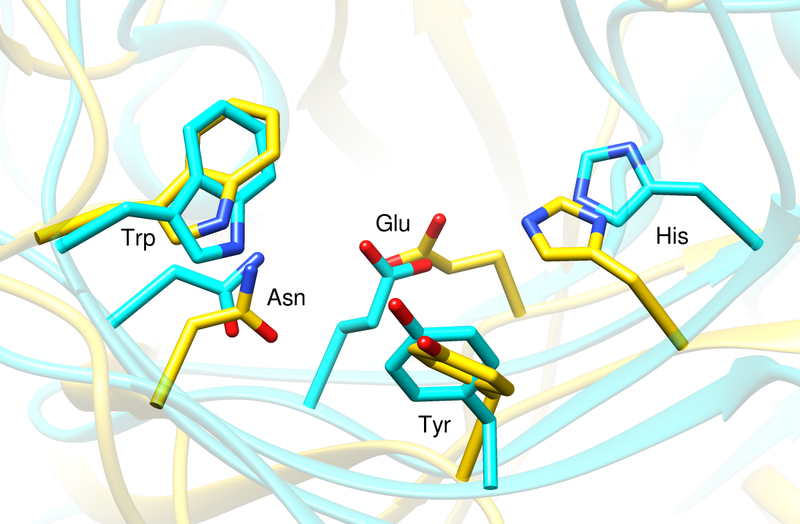 Detection of protein three-dimensional side-chain patterns: new examples of convergent evolution. Russell RB. J Mol Biol. 1998 Jun 26;279(5):1211-27. The recipe here is just an example; there are usually many routes to the same or similar results. Not all of the steps can be done with commands – for example, there is no substitute for interactively finding the best views – but commands for much of the setup below are collected into the Chimera command file convergent.com. 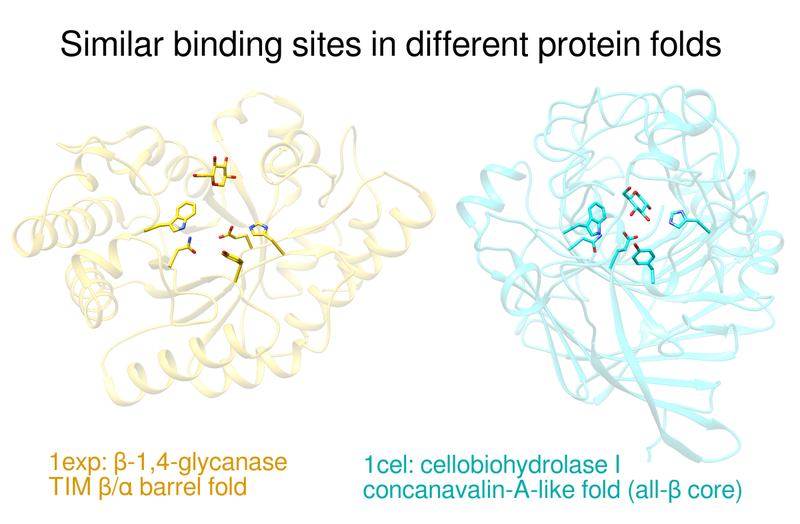 The images show (A) the two proteins side by side, (B) a closeup of the superimposed sites without glucose, and (C) a thumbnail of the superimposed sites. Often it is best to create a set of views that, while different, are consistent or related to each other by only simple transformations. We will generate the view shown in B first and then base the others upon it. Move and scale the structures using the mouse and the Side View as you wish throughout the tutorial. The aliases in the above match command specify entire residues. The match command requires equal numbers of atoms from the two structures, specified in the same order. In this case, the residues are of the same types (thus containing the same numbers of atoms) and the atoms of each residue will be in the same order because they are automatically sorted by name. The ,r part indicates that only ribbons should be affected, not atoms, bonds, surfaces, etc. It does not have to be perfect; the same command can be used again later to re-save the position after further adjustments. You may also wish to save the session (see the File menu) at this stage and whenever you are pleased with your previous work and want to ensure it will not be lost. Next, generate and save positions for the other two figures. The intent is to preserve the orientations in the closeup position while possibly translating up/down and left/right and changing the scale. Scaling can be done with the mouse, or with the command scale, or by moving the small square in the Side View. Translations (up/down, left/right) can be performed with the mouse or with the command move. If you make a mistake, you can simply revert to the closeup position and start over. Chimera scenes are similar to positions but contain more information such as colors, display styles, and which atoms and labels are displayed. If scenes are saved and restored, it will not be necessary to manually display and undisplay the glucose residues and the appropriate labels between saving the different images. However, a drawback of scenes is that they increase session file size. Start 2D Labels (under Tools... Utilities) to annotate the images. Next, hide all of these labels using the Shown checkboxes in the 2D Labels dialog. We will not make the window thumbnail-sized until right before saving the image. Now all of the work other than saving the images is done. You should definitely save the session (see the File menu) at this point; it will include the labels, saved positions, and saved scenes. The images can be saved now or later, after quitting from Chimera, restarting Chimera, and restoring the session. Of course, the scaling could have been done interactively with the mouse, but instead a scale factor was determined empirically (by resetting and trying different values) and written down so that the thumbnail could also be reproduced exactly from the session that had already been saved.